The Cycad, the hotel’s main dining area is enhanced by several features – the counter hand-crafted by the 1820 Settlers, fireplaces & French doors leading to the pool where alfresco dining may be enjoyed on balmy summer nights. Hotel Leisure Facilities include a swimming pool, tennis courts, kiddie’s playground area, pool table, game drives, hiking trails, bird watching and horse trails. Meals – Guests can be expected to enjoy a leisurely country breakfast and during the day the Terrace menu is available for light snacks. Zuurberg Mountain Village offers a Classic 5 course Carvery or Table d’hôte. 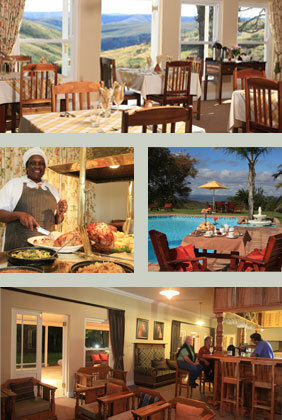 The Zuurberg Mountain Villages Traditional Sunday Carvery is legendary. Guests still travel from afar to celebrate this gourmet experience.